The other big factor was getting a few hams to spot me on the clusters. I was quite surprised, and thrilled actually, to be the subject of a pileup for a few minutes. Imagine, lil’ ol’ me, being sought after; I hardly knew how to handle the fame! Things started kinda slow, my first contact being a ham about two miles away; I’m thinking, oh boy, this’ll be a long afternoon. Will I ever get the requisite ten qso’s to count a POTA activation? I tried to spot myself but on Dxsummit.fi it is so awkward to do on your smartphone. With ten thumbs like me, mistakes are made. I did ask several hams to spot me and soon a few did, and then I was in demand, even at 4pm on a Tuesday afternoon. I never knew there were so many retired or unemployed hams sitting around bored during the day. From South Florida I worked hams in NY, CT, MI, PA, MN, AZ, CA, England and Spain! I used my link dipole antenna up approx 24′ at the apex, set for 20m. By closing a pair of links, it can be reset for 30 or 40 meters. I built this antenna a while back, and tuned and trimmed it carefully for each of these bands, so no tuner necessary. I’ve tried a PAR EndFedz and a homebrew Buddipole for HF and this is the best for me, thus far. From left to right: the dipole (made of speaker wire) rolled up on custom deluxe wire winder; middle, the handsomely crafted center SO; and right, the links for 30m, left open so antenna resonates at the shorter 20m cut. Note “stress relief” at the SO and use of safety pins to carry the tension of the dipole when hoisted. Below is pic of my antenna launching tool; it was too heavy at first so I drank half the contents. Also below is a pic of my tie down line, fluorescent builder’s twine. I’ve decided to be stealthier in the future and will change that out for something that’ll blend better. I want to be stealthier so I don’t draw attention to my station and my suspicious behaviors. Even though I have a right to be there at a picnic table not all Park Rangers got the memo and some may think they should run me off. Last week a Ranger did stop by and I thought “well, here we go,” but actually he just wanted to chat; his Dad had been a ham, so I tried to recruit him. I had another visitor, too; note to self, don’t operate so close to garbage cans! And finally, a note to the wise for operating out of doors in Florida; bring your bottle! K4WK on deserved vacation activating DuBois Park in Jupiter, Fla Dec 2 and trying out my “new” used radio: Icom 706. Four qso’s – Fla, Ga, SC and Va on 40m. Lots of noise. Didn’t realize till later I could’ve participated in BOTA (yes, another *OTA program), Beaches on the Air. Think of the pileup I missed! Tried two antennas: first was an End Fedz and it worked pretty poorly for me; then I hooked my old reliable Link Dipole as a sort of inverted vee that worked some better but overall, results were disappointing. Need to try to get it higher. This time was maybe 15-18 feet at the apex, in a wooded area. In an area of Palm Trees, not a lot of branches to throw a line over, but there were a few oaks to use. CW many times more effective in getting a signal thru than is SSB. An example was last wkend, April 13, when I was at my cabin in NC testing a homebrew Buddistick I would use the following day on a SOTA activation of a mtn on the Blue Ridge Pkwy. I was particularly interested in 40m so I could communicate with my friends in Georgia so WA4ZXV in Atl agreed to a sked. On SSB it was worthless but on CW he heard me with 2.5w and I got 569 rst. Yes, Mr. Murphy, who had been bothering me all day Saturday while tuning (or trying to tune) my homebrew buddistick vertical, trailed me Sunday for my SOTA Activation of Clingmans Dome. First, at the top ( steepish climb, btw) there were no hoped-for picnic tables for me to comfortably sit and operate. Second, even tho it was Easter Sunday there were plently of people around to become curious abt my activities so I located a little ways down a side trail that went nowhere. The antenna did not tune up any better on Clingmans than it did on my back deck; i.e., SWR of up to 20, but I operated anyway. I could hear my Atlanta friends very well but none could hear me on 40m. 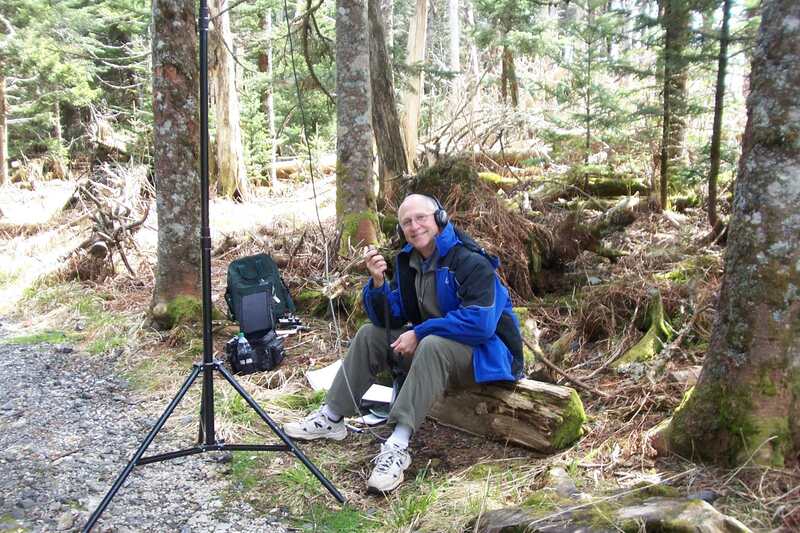 N4EX, a big SOTA player and Association Regional Manager, worked me easily fm Raleigh. That was all for 40 min when I moved up to 20m. At 14.285, the qrp freq, there were some spanish-speaking hams but they were 44 so I didn’t think I’d bother them. Amazingly, I did bother them with 2.5 watts and a poor antenna so I had to QSY. Went up to 14.287 and ND0C answered my CQ, N1EU, W7CNL and KK1W. That made five qso’s and only four are needed to win points for the activation so my first SOTA was a (mild) success and I’ve captured ten points. Now need only 90 more!